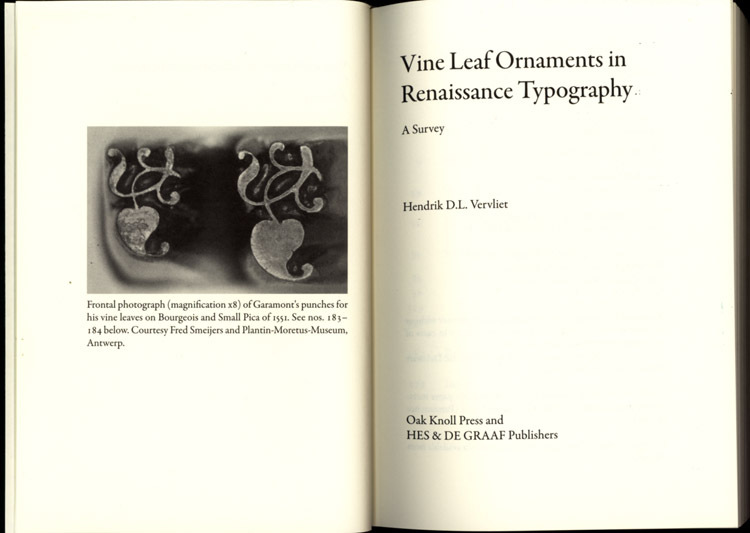 Hendrik D. L. Vervliet, Vine Leaf Ornaments in Renaissance Typography. A Survey. New Castle, DE: Oak Knoll Press and Houten, NL: Hes & De Graaf, 2012. 416 pp., hardback. In my capacity as a typographer, I am often asked, "What are those little doohickeys called?" "Hey, who are you calling dingbats?!" In the manuscript era scribes would add pointing fists for emphasis, pilcrows to indicate a new paragraph, and sometimes fill out a line of their manuscript with curlicues or doodles. They had horror vacui, but vellum was at a premium so they didn't like to leave blank space. Decoration could also be used to mask errors: you could cover your mistake with squiggles and then write the correct text afresh on the next line. In the early days of typewriter some bright spark realized that not everyone could spell accurately so came up with a key that was neither an "a" nor an "e" that you hit for an indistinct character. Progress! Surprisingly, in the early days of type, before sextiles, octothorps, interrobangs, shnik-signs, lb-signs or other commercial symbols were invented, type-cutters felt a need for and created a purely decorative small heart-shaped device with a stem, called a vine leaf (sometimes erroneously known as an Aldine leaf). Hendrik Vervliet, Librarian emeritus at the University of Antwerp and former Director of the Plantin-Moretus Museum, has created a visual index to over 200 of these ornamental vine leaves found in Renaissance books. He has also identified most of the cutters and given information as to where they first appeared. It's a staggering task, though perhaps in scholarly terms, just a by-product of his decades of research on the types of the same period. 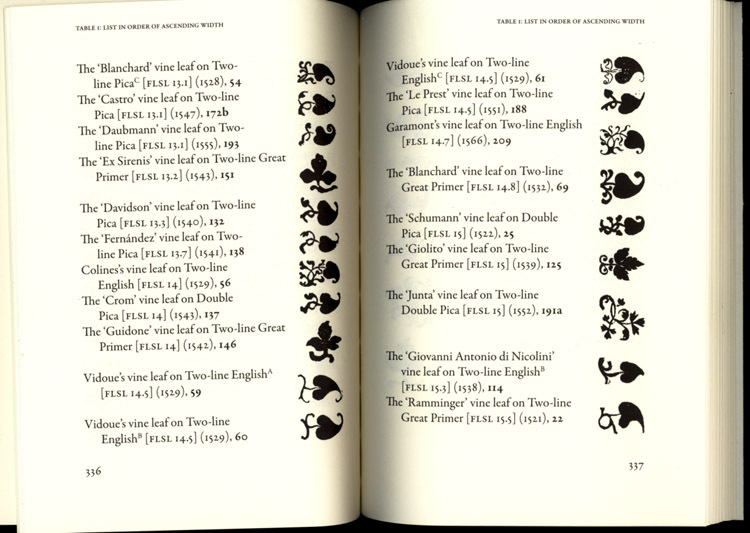 In the last couple of years Dr Vervliet has published a Conspectus of French Renaissance Printing Types (2010) and two volumes on the Paleotypography of the French Renaissance (2011) which complement his earlier works, including Sixteenth-century Printing Types of the Low Countries (1968). These two recent books finally click into place the whole jigsaw of the spread of roman type after it left Italy in the 1530s and started to move out from Lyons and Paris to Antwerp, Orleans and Geneva, and finally peripheral locations like London and Stockholm. In these works, Vervliet identified the roles and work of the major players, Claude Garamont and Robert Granjon, and lesser-known type-cutters Simon de Colines, Pierre Haultin, Guillaume Le Bé, Antoine Augereau and Maître Constantin. Haultin was first to cut small types that were large on the body, therefore more legible in tiny sizes. These were needed for printing the Calvinist Bibles which had to be small enough to be hidden. Well in advance of the Gideons, their promoters would go through Geneva at night and throw their Bibles through open windows! De Colines was a great artist, both as a type-cutter and as a book designer; Le Bé was the go-to guy for Hebrew type; while Constantin and Augereau perfected the Venetian model of Aldus and produced the first families, or graduated series of type sizes that matched. While Garamont (whose name is still known in its modern form of Garamond) was the technical perfectionist and supreme type-cutter of the Baroque period, Granjon got to play in the margins, cutting lovely types based on his own handwriting (called civilité: also the subject of a major study by Vervliet with Harry Carter in 1966), he refined and realigned italic, putting it into the shape we know today, he cut many non-roman types (Arabic, Cyrillic, Greek, Armenian, etc), cursive music (thus, it could be argued, paving the way for music to swing and eventually ... to jazz! ), and a series of interchangeable abstract designs on type bodies called "arabesques" that could be built up to make patterns and borders. These could be cast fresh and combined to fit any space, unlike woodcuts which wore out or had to be cut down to suit new occasions. 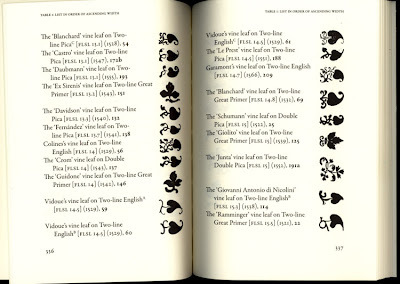 These printers' ornaments are distinct from vine leaves though (and were the subject of a 1955 essay by Stanley Morison, called "Venice and the Arabesque Ornament"). Vine leaves had been used as word dividers in the ancient world (seen in Greek and Roman inscriptions of the first century) and continued to be used like this or as a period, new paragraph indicator or line filler in the manuscript era. 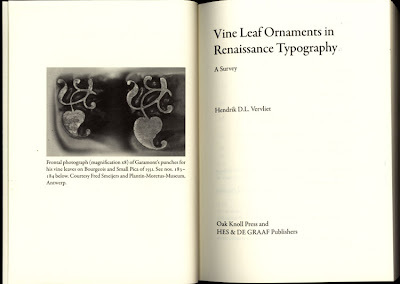 Vervliet believes the first printer to employ a typographic vine leaf was the great Erhard Ratdolt (1447–1528) who gave us the structural apparatus (title page, page numbers, chapter divisions, and so on) that we still rely on today. The leaf soon evolved into a purely decorative motif. The vine leaves are surprisingly varied in style. I had always thought that there were only one or two forms, but in the end their diversity strikes me like the Bechers' photo documentation of German gasometers, water towers, and half-timbered houses that magnify little differences by juxtaposition. These symbols form part of a complex vocabulary, encompassing the shapes of the roman alphabet and the ancillary glyphs that we encounter every day. These forms were in flux in the early era of printed books but left the hands of the French cutters in a form still recognized today. In many ways they are the substructure of our written and printed culture for we have never improved on the models of Garamont and Granjon. To see them afresh, five hundred years after they were created, is what Vervliet has done. Though it is a minor part of our culture it is still an important one and these masters need to be celebrated, both for their work and their play. Last year's harvest was big in France and this has been a bumper year for California's grapes, so let's raise a glass to the punch-cutters of yore who decided to give us the typographic vine leaf. Historically, they have also been known as "printer's flowers" even when they did not look like flowers.